San Antonio, Ibiza. Cool & stylish, Beach, Adults-only, San Antonio Town, 4-5 Stars. Stylish hotel directly on San Antonio’s seafront with a glamorous art deco design and superb sunset views. 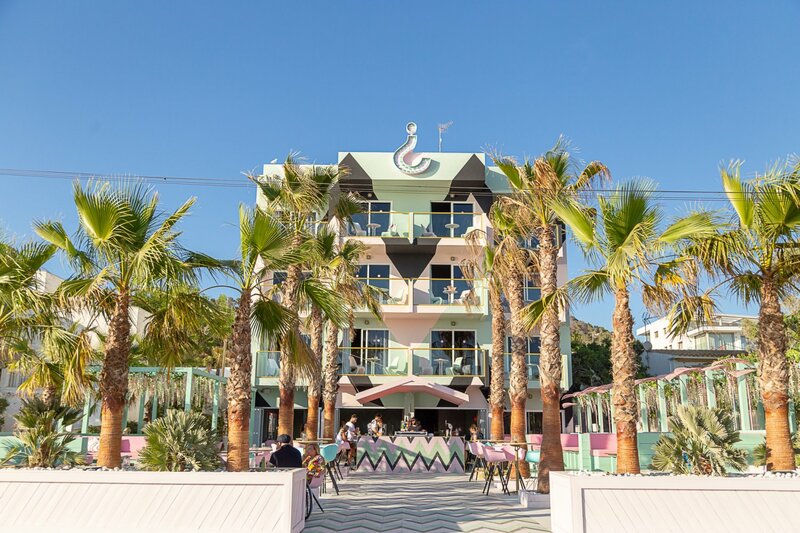 Wi-Ki-Woo Hotel Ibiza - This superb adults-only hotel is made out in beautiful pastel shades in a sparkling art-deco style, with lots of special touches to bring you an “experience like no other”. A sweeping entrance leads you to an inverted question mark; where the only first enquiry you should have would be whether to make your way to the long tiled bar or dive into the big pool at the back, where you can chill-out under pink palm leaves. The sea-facing art deco terrace is the perfect setting to relax with a delicious item from the cocktail menu. An on-site restaurant promises to delight with an exotic fusion menu made from fresh, local ingredients. The hotel's concierge service is there to help with any need, plus a 9-seater Mercedes can be booked to take or pick you up anywhere on the island. There are rooms and chalets with a great range of facilities and modern comforts available. Double rooms also can be booked with sea views. Chalets are located in a separate building overlooking the pool, they offer spacious modern interior and private terraces. The Wi-Ki-Woo is situated in a quiet spot directly on the seafront in San Antonio; the large terrace overlooking the bay gives you an ideal point to watch the amazing Ibiza sunsets – or venture to the famous Sunset Strip, only steps away. Small but trendy Caló des Moro beach is a short stroll with the broad main beach of San Antonio just a 15-minute walk away. The harbour is even closer and here you will find small ferries that take you to the beautiful beaches of the west, like Cala Conta and Cala Bassa. Super-clubs Es Paradis and Eden can be accessed fast for a night of dazzle and dancing. San Antonio's bus station is just 500 metres away with the all-night disco bus going to all the top clubs.